The new Brazilian ambassador to the Republic of Seychelles, H.E. Mr Antonio Augusto Martins Cesar, presented his credentials to President Danny Faure at State House today. The Head of State congratulated Ambassador Cesar on his accreditation and wished him success in his new role enhancing the already strong bilateral relations between Seychelles and Brazil during his tenure as Ambassador to Seychelles. The talks between the President and Ambassador Cesar centred on opportunities to further cement cooperation in different sectors, such as in environment, blue economy and tourism. After the accreditation ceremony, Ambassador Cesar described the relations between Seychelles and Brazil to the national media as solid and healthy, both locally and in the international arena where both countries share common interests. Seychelles and Brazil established diplomatic relations on 12th November 1986. 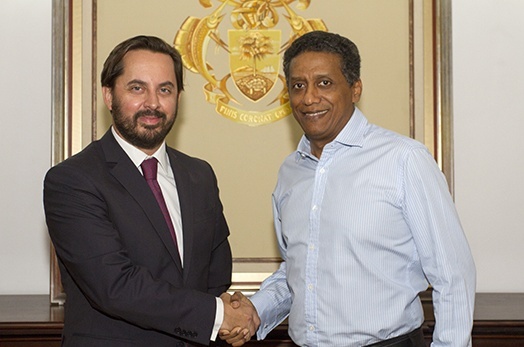 Ambassador Antonio Cesar will be based in Dar es Salaam, Tanzania. Also present at the meeting was the Secretary of State for Foreign Affairs and The Blue Economy Ambassador Barry Faure, Principal Secretary at the Department of Foreign Affairs, Ms Marina Confait, and First Secretary in the Department of Foreign Affairs, Ms Patsy Moustache.